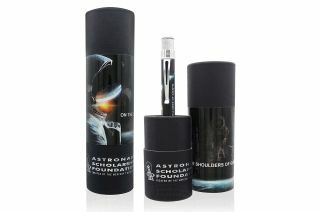 The Astronaut Scholarship Foundation has partnered with Retro 1951 to offer the exclusive "On the Shoulders of Giants" Retro 51 Tornado rollerball pen. A new collectible pen comes with a unique feature: the ability to help underwrite the future of U.S. space exploration. The Astronaut Scholarship Foundation (ASF) has partnered with Retro 1951, the maker of the popular Tornado line of rollerball pens, to offer a new writing instrument in support of the foundation's "On the Shoulders of Giants" campaign. The ASF awards 50 scholarships valued up to $10,000 to U.S. college students excelling in science, technology, mathematics and engineering (STEM) degrees. In addition to financial support, the scholars receive networking, professional development and mentoring opportunities from the foundation's Apollo and space shuttle-era astronaut members, as well as from other scholars and technology leaders throughout their careers. The ASF launched the "On the Shoulders of Giants" campaign to raise $3.2 million, matching the funds that will be generated from its part in the U.S. Mint's 2019 Apollo 11 50th Anniversary Commemorative Coin program beginning in January. Proceeds from the ASF's new Retro 51 "On the Shoulders of Giants" pens will go toward that fund. "The moon landing was one of humankind's greatest achievements, and this monumental feat wouldn't have been possible without nearly 10 years of talent, ambition and courage put forth from giants within the Mercury, Gemini and Apollo programs," said Tammy Sudler, president and CEO of the Astronaut Scholarship Foundation. "Their work unleashed a wave of global innovation and inspired generations to pursue STEM careers." "This campaign not only honors their legacies, but the entire space journey through present day and into the future. Money raised will fund our prestigious scholarship program and propel the next era of explorers and innovators," said Sudler. The exclusive, numbered "On the Shoulders of Giants" Retro 51 pens feature the campaign's astronaut-themed artwork both on the pen and its tube packaging. The pens debut for sale on Friday (Sept. 21) through the ASF website for $55 each. The "On the Shoulders of Giants" pen features an astronaut-theme wraparound design. Retro 51 previously offered three limited edition space-related pens, including one themed to Project Apollo and a "Mission to Mars" pen inspired by NASA's Space Launch System (SLS) rocket. The company's first pen to celebrate space history, the Saturn V rocket inspired-"Lift Off," was voted the company's most popular pen. "We were really honored when we were contacted by the Astronaut Scholarship Foundation," said Ross Cameron, spokesman for Retro 1951. "The more we talked about working together, the more it seemed like a natural fit for both them and for us. We are pleased we were able to put this project together for them." The partnership between the ASF and Retro 1951 will continue later this winter with the debut of a new series of pens celebrating the 50th anniversary of the first moon landing. Over the course of the past three decades, the Astronaut Scholarship Foundation has awarded more than $4.5 million to more than 500 students who have gone on to develop technological innovations in health care, energy, defense, aerospace, homeland security and many other fields in science and technology. In 2013, Christina Hammock Koch became the first ASF scholar to be selected for NASA's astronaut corps. She is assigned to fly to the International Space Station in 2019. Watch a video about the Astronaut Scholarship Foundation's On the Shoulders of Giants campaign at collectSPACE.